African Peanut Soup Recipe - A Vegan Soup at Oh My Veggies! You know how sometimes you have really crisp, distinct memories of nothing in particular? I barely remember what I ate for lunch yesterday, but for some reason, I have a very clear memory of making peanut soup in our old apartment back in Wisconsin. I was frozen to the bone after getting home from work and looking out the kitchen window, I could see the snow falling in the street lights. I remember getting the cilantro out of the crisper drawer, measuring out the peanut butter, and chopping the onions. So now, I always associate peanut soup with cold weather and snowy evenings. Which kind of makes it perfect for January, right? 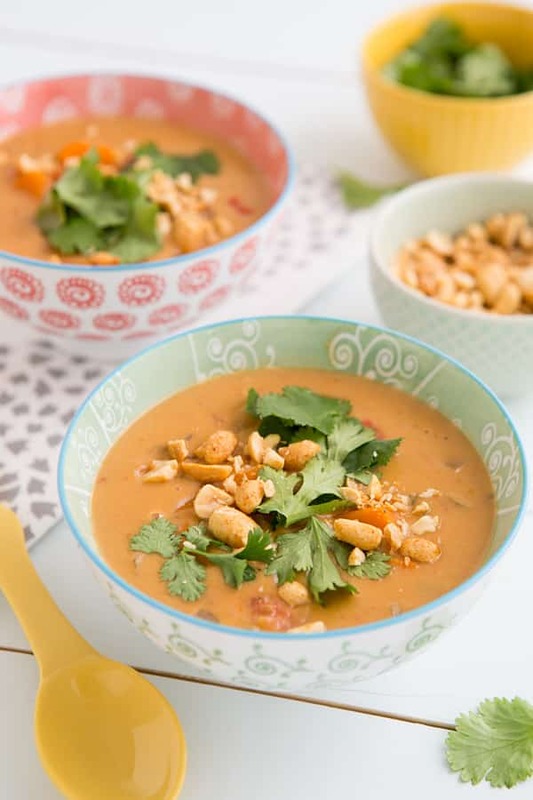 This particular African Peanut Soup recipe is from The 30 Minute Vegan: Soup’s On! by Mark Reinfeld. 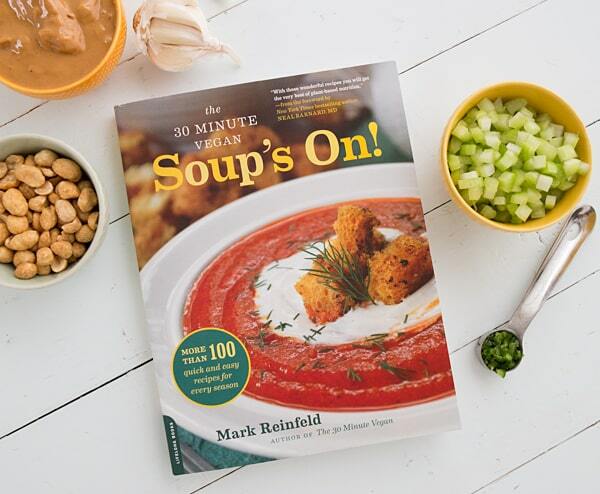 I am so excited about this book–it contains over 100 plant-based soup recipes! But the best part is that almost all the soups come together in 30 minutes or less. Yes, you can have soup for dinner in 30 minutes! If you resolved to make more home cooked meatless meals in the New Year, this is the kind of cookbook you need–these are doable recipes, not the fussy kind that you need to make on a Sunday afternoon. These are after work recipes! Peanut soup is not exactly the lightest soup, but this recipe includes an option for trimming things down a little bit by using less coconut milk. 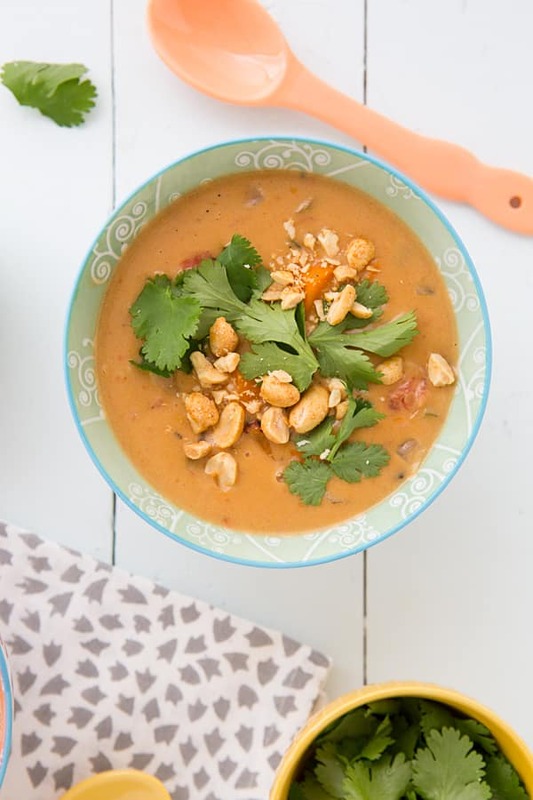 I made the non-light version because even though this African Peanut Soup is pretty calorie-dense, it’s also very filling, so I don’t feel the need to go back for seconds. The chunks of sweet potatoes are perfect with the creamy, peanutty base; although the book recommends garnishing with a Red Pepper Coulis, we loved it with just a scattering of cilantro and chopped peanuts on top. This post was originally published on January 16, 2014. Place the vegetable stock in a 3-quart pot over medium-high heat. Add all the remaining ingredients, except the peanut butter, cilantro, and peanuts, and cook for 15 minutes, stirring occasionally. Remove about 1 cup of the liquid and place it into a small bowl. Add the peanut butter and stir until creamy. Return the mixture to the pot, stir well, and cook for 5 minutes, stirring occasionally. Add the cilantro, stir well, and garnish with peanuts before serving. You can sauté the onion, celery, and garlic in 1 tablespoon of oil before adding the vegetable stock. Replace the peanut butter with almond butter or other nut butter. For a lighter soup, replace one can of coconut milk with an equivalent amount of vegetable stock or water. Add 2 cups of chopped spinach, chard, or kale once the peanut butter is added. Disclosure: I received a copy of The 30 Minute Vegan: Soup’s On! in order to write up this review. Wow! This was delicious and my husband is convinced this is what he wants to eat everyday for at least the next week. Was very easy once I got all the prep out of the way, I’m a little slow so it definitely took me more than 10 minutes :p thank you for posting!! We made this last night with some trepidation as we have never had anything like this before. It was delicious! It was similar to the springroll dipping sauce we get at a local thai restaurant. We will make this again. Thanks for sharing it. This was great! Next time I’ll add a bit more spice to it. It was a little underseasoned for me. I added siracha, extra cilantro, and fresh red bell pepper. I wouldn’t say this is an African soup because I’m pretty sure African soups aren’t made with cilantro, coconut milk, tamari or soy sauce and I know that you just used the name given in the book. Do you need to pre-soften the sweet potato? I’m worried it’ll be too hard with such a short boiling period.